Heat oven to 425°F. Line cookie sheet with foil. Place rack on foil; spray rack with cooking spray. In resealable gallon-size food-storage plastic bag, mix yogurt, soy sauce and garlic. Place chicken strips in bag; seal, and squeeze bag to coat chicken. Refrigerate. In another resealable gallon-size food-storage plastic bag, mix flour, thyme and bread crumbs. Remove chicken from yogurt marinade a few pieces at a time, scraping off excess yogurt mixture, and place in bag of bread crumb mixture. Toss chicken to coat evenly; place on rack on cookie sheet. Spray chicken lightly with cooking spray. Bake 15 to 20 minutes or until chicken is no longer pink in center. Cool 5 minutes while assembling salad. Divide spinach among 4 salad plates. 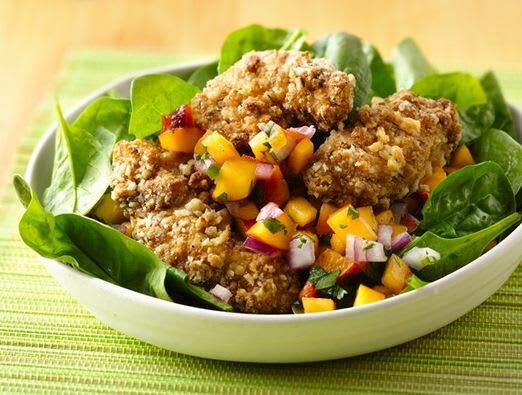 Spoon 1/2 cup peach salsa over each; top each with 4 pieces chicken. Serve immediately. Don't feel like salad? These chicken tenders are delicious on their own. Create your own dipping sauce for a new twist. Did you know salsa makes a delicious and lower fat salad dressing than most dressings that are full of oil?